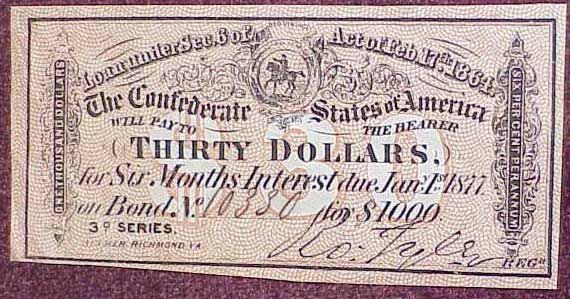 This is a nice original Confederate Bond Interest Coupon. It comes nicely displayed in a riker box. When the Confederacy issued savings bonds they had these coupons attached. When the redemption date on the coupon arrived you could cash in the coupon for your interest payment. As you can see this one has the original ink serial number hand written on the paper and the printed signature just as it should be. 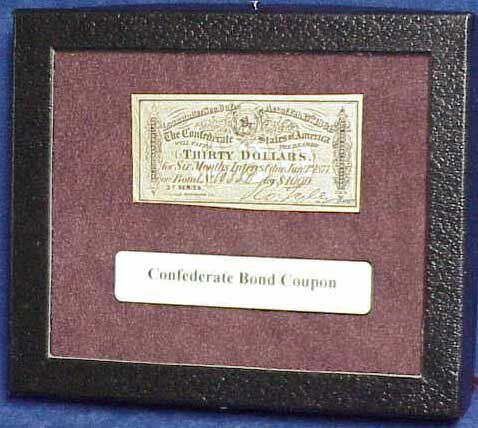 You get the original Confederate savings bond coupon in a 5 by 6 inch riker with a cloth background. Cool artifact display for only $14.95.